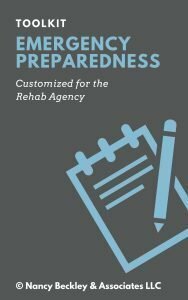 For the Rehab Agency pulling together the extensive set of requirements to meet the Emergency Preparedness Conditions of Participation, Help is on the way! This is the companion piece designed to assist you in planning and development of the substantial requirements under the Emergency Preparedness Condition of Participation. 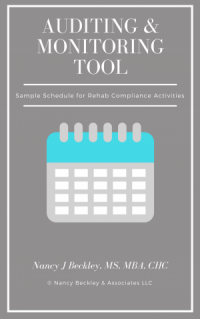 Our Rehab Agency Policy & Procedure Manual includes the relevant emergency preparedness policies, but there are substantial community-based activities as well as training and testing exercises, and a facility-specific communication plan that all need to be completed. The Emergency Preparedness Toolkit will assist in the identifying tasks and resources. Join our Platinum Membership exclusively for Rehab Agencies and CORFs and receive a 50% discount on the Rehab Agency Policy & Procedure Manual. 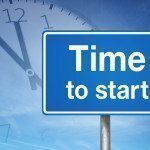 By the way – if you are contemplating becoming a rehab agency, and not quite sure, we have an on-demand webinar explaining Rehab Agency basics, the Conditions of Participation and Interpretive Guidelines.